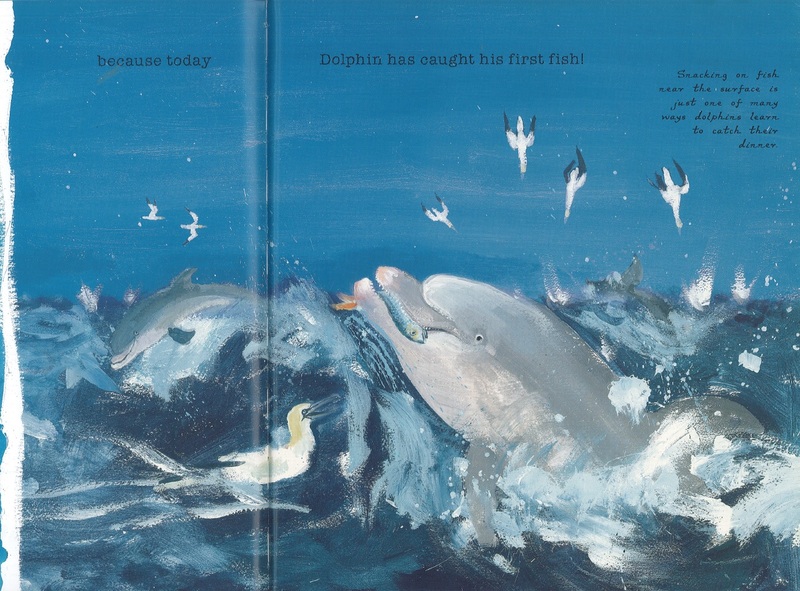 The publisher says… The moment Dolphin Baby pops into the blue, he swims up, up, up …and takes his very first breath. From then on, the baby calf swims close to his mother’s side, discovering all there is to know about life under the sea. Dolphin has lots to learn including making new friends, catching his first fish, whistling …and saying his own name in special dolphin-sound! Eva says… This is the BEST fact book ever about DOLPHINS, and you know why? Because it’s a STORY! I like that other one I read a while ago (Do Dolphins Really Smile?) but that one was just facts. THIS one is facts AND a story. And the story is about how this baby dolphin grows up and learns to catch fish all by himself. And NO TRASH, either! What’s good is that all these dolphins have their own names and that’s how they can tell each other apart. Because they kind of all look the same to me. But they sure don’t sound all the same to DOLPHINS. And dolphins aren’t fish, so I guess that’s why they LIKE fish. Anyway, these guys are mammals, which means they have to breathe air even though they live in the water. So they go up and take a breath and then swim some, and then take ANOTHER breath and go down and swim some MORE. And they swim at the top of the water because that’s where the FISH are. And baby dolphins can’t swim that deep, and when they’re not with their moms they can still hear her, because she whistles and clicks. And the babies are called CALVES, which is what baby cows are called, and you know what else? Dolphins drink MILK like cows. And people. But they don’t get it in a store. They drink it from their moms like babies do. So that’s a LOT of facts in this book, plus it was a story. So see why I said it’s a GREAT one?